Trump Set To Announce Supreme Court Nominee The president has moved up his Supreme Court nominee announcement to Tuesday. He is expected to choose from one of three judges, any of whom would be a socially conservative voice on the court. A protester carries a sign in front of the Supreme Court during a protest about President Trump's recent executive orders on Monday in Washington, D.C.
President Trump is set to announce his pick for the U.S. Supreme Court on Tuesday, fulfilling a promise he made to social conservatives on the campaign trail to name someone like the late Justice Antonin Scalia, a conservative icon whose seat has been vacant for almost a year. The White House moved up the announcement by two days, a step that observers saw as an attempt to change the subject away from the president's controversial immigration order. The order has provoked widespread criticism in the U.S. and among allies abroad, not to mention among leading Republicans in Congress. Whoever the president selects, the confirmation hearings are likely to set up a full-scale attack from Democrats on some of Trump's immigration policies. The leading contenders for the nomination are said to be three federal appeals court judges: all very conservative, all relatively young, all millionaires and all nominated to the bench by President George W. Bush. 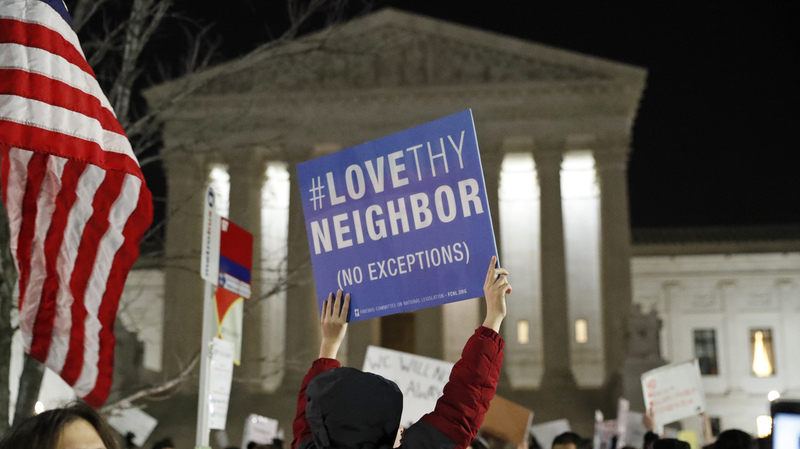 The two who seem to be at the head of the line are Neil Gorsuch, a well-regarded 49-year-old judge on the appeals court based in Denver, and Thomas Hardiman, a popular 51-year-old judge on the appeals court based in Philadelphia. Hardiman is said to be well-liked by Maryanne Trump Barry, the president's sister, a judge on the same Philadelphia court. Gorsuch and Hardiman seem in some ways to be the flip sides of each other: Gorsuch is a scholarly Ivy Leaguer and Hardiman is a longtime litigator with lots of experience trying cases, who is said to have a "practical approach." Gorsuch, a Colorado native, is proof that you can acquire a personality that is diametrically different from your parents. His mother, Anne Gorsuch Burford, was a highly controversial, take-no-prisoners head of the Environmental Protection Agency during the Reagan administration, and known for being quite the bomb thrower. But lawyers and judges alike describe her son as unfailingly polite, diplomatic, a good listener and a good colleague — to the point of being obsequious. Gorsuch is a reliable conservative on social issues. His best-known votes are in decisions siding with challenges to regulations requiring employers to provide birth control coverage for women under the Affordable Care Act. He earned his undergraduate degree at Columbia University, where he co-founded a newspaper aimed at rebutting what he considered the dominant liberal and "politically correct" philosophy on campus. A graduate of Harvard Law School, he also earned a doctorate in legal philosophy at Oxford University, where he studied as a Truman Scholar. In private practice in Washington, D.C., Gorsuch represented mostly corporate clients, and in 2005 he became principal associate attorney general in the Bush administration Justice Department. A year later, Gorsuch was nominated to the 10th U.S. Circuit Court of Appeals, where he has earned a reputation as a cerebral conservative with a flair for vivid and clear writing that is similar to — though not as sharp in tone as — Justice Scalia's. He is known as a critic of a decades-old Supreme Court legal precedent that requires courts to defer to reasonable agency interpretations of ambiguous language in broad statutes. In that sense, he is more conservative than Scalia, who supported that precedent. In contrast to Judge Gorsuch, Judge Hardiman is not an Ivy Leaguer, but as one of his friends put it, he went to the "Catholic Ivy Leagues" — Notre Dame University for his undergraduate degree and Georgetown for his law degree, where he helped put himself through school driving a cab. He was initially nominated by President George W. Bush to the federal district court in Pittsburgh and was later elevated to the Philadelphia appeals court. His conservatism has demonstrated itself most prominently in gun cases, where he has ruled often in favor of the right to bear arms. For instance, he dissented from a decision that upheld New Jersey's restrictive law on who may receive a permit to carry a gun. The Supreme Court left that decision in place by refusing to review it. It did review — and uphold — a decision Hardiman wrote declaring that jails were justified in conducting strip searches of individuals arrested but not yet convicted of any charge, even a minor traffic charge. Hardiman is one of those people who is well-liked by associates of all political stripes. He is described as "down to earth" and smart; he is, as a friend put it, "a closet scholar." He "knows the Hobbes and Lockean philosophy behind the Federalist Papers." Friends and associates describe him as "a devout Catholic," one who "knows Thomas Aquinas." Several people noted that because of his many years as a trial lawyer and trial judge, he has more experience trying cases than most of the other Supreme Court justices. The third contender for the vacant Supreme Court seat is Alabama's William H. Pryor Jr., who sits on the federal appeals court based in Atlanta. He was the odds-on favorite going in, in part because he is a protege of Sen. Jeff Sessions, Trump's pick for attorney general. But Pryor's record is by far the most controversial. Among other things, he called Roe v. Wade the "worst abomination" in American jurisprudence. As Alabama state attorney general, Pryor urged the Supreme Court to uphold state laws that criminalized private consensual homosexual conduct. While Judges Hardiman and Gorsuch were both confirmed without dissent, Pryor was blocked by Democrats and was only confirmed in a later deal. So a Pryor nomination would undoubtedly spark a major donnybrook. Democrats, of course, are in the minority in the Senate, which must confirm the president's nominee. Many Democratic senators view the Supreme Court nomination as one that was stolen from them when Republicans, in a precedent-setting move, refused for almost a year to even consider President Barack Obama's nominee to fill the seat left vacant when Justice Scalia passed away. Already, some Democrats are promising to filibuster any nominee. The filibuster is still in place for Supreme Court nominees, meaning it would take 60 votes to confirm. But Republicans could change that rule pretty much any time they want. Some Democrats may want to save that card for the next battle — when, if there is a vacancy, President Trump would likely be replacing, not a conservative like Scalia, but a more liberal justice, thus changing the balance on the Supreme Court for decades. In a previous version of this story, we said Judge Pryor sits on a federal appeals court based in New Orleans. In fact, Judge Pryor's court is based in Atlanta.